We have again become distracted by affairs that boil the pot. So must we all at some time. And speaking of fire...maybe our lack of practice has made that the best segue we can offer...what brings us back to our post is the recent passing of Earl Cooley, a firefighter we have never personally met, though circumstances have allowed us to meet many firefighters. Yes, several of our recent posts have been at least partly obituaries: John Hughes, Billy Mays, were there others? We offer no explanations, excuses or rationalizations. This post is not about Earl Cooley. Its more about Wag Dodge, though ultimately its not about him either. But to get to Dodge we must go through Cooley, and once through Cooley we'll see where we end up. Cooley passed in November, at the age of 98, and that gives you a hint about where our story begins. In July of 1940, Cooley and his partner stepped out of an airplane and into the Montana sky. Their job was to confront a forest fire and quickly bring it under control while it could still be brought under control. They were the first smoke jumpers, poorly trained, poorly equipped, yet confident past the edge of hubris. Cooley described his training as "This is a parachute. You know what a fire is. You jump tomorrow." His chute didnt open properly that day, and he survived by crashing through the branches of a quick-thinking spruce. But within four hours, he and his partner had won the smoke jumpers' first battle. On August 5, 1949 Cooley was once again in a plane over Montana heading to a fire, this time as a spotter. Crouched down in the open doorway of the plane, his job was to find the best place to drop the crew of smoke jumpers, and as they lined up at the door, to then tap each man on his left leg as a signal that it was his turn to step into the sky. The first leg he tapped that afternoon was that of Wag Dodge, the foreman of the crew that was jumping into Mann Gulch. You may be familiar with the story of Mann Gulch. Perhaps not. In Montana it is passed down as oral tradition. 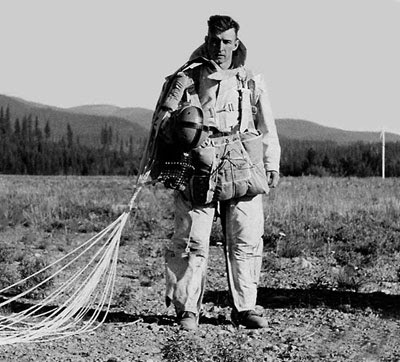 For smoke jumpers, the tragedy is the painful spasm that defines the birth of the profession. Most never heard of the story until Norman Maclean's brilliant treatment, Young Men and Fire, which won the National Book Critics Circle Award in 1992. Thirteen men burned to death that day. Cooley had done his job well, safely setting the crew on the north slope of the gulch, opposite the fire burning on the southern ridge. But it is here that in our story that we bid farewell and peace to Earl Cooley and move our attention to Wag Dodge. After inspecting the fire, Dodge became concerned about the situation and began walking his men to the safety of the Missouri River which lay at one end of the gulch. Before they could make much progress the winds switched direction and carried the fire from the forest on the southern slope to the waist-high grass of the northern slope on which the men stood. We learn many things from Maclean's story, and one thing in particular which is relevant to this moment in Mann Gulch. Fire, it seems, loves running through waist-high grass up a 76% grade. Men are different. The race to the northern ridge lasted about ten minutes. Two men made it over the top with the fire at their backs. Thirteen lay where their legs gave out or the fire out ran them. Thank you Tio Tito, we hear you say. It is a compelling story, as tragedies so often are, and we're sure that Maclean's version is even better. But you haven't yet made the connection to marketing and we are beginning to fear that you never will. Unfortunately you are correct dear readers. Maclean's telling of the story is greatly superior. Those who read it never forget it. And yes, we haven't connected the story to marketing, and we're not sure that we can, at least not to anyones satisfaction other than our own. But what we never expected, and you may not have either, is that the story of the race up the northern slope of Mann Gulch has inspired many to contemplations and explorations of insight and creativity. Wag Dodge never made it to the top, and realizing the futility of the effort, gave up on his attempt. Let's bring some numbers into this story. When Dodge stopped he was about 200 yards short of the ridge, the wall of fire was about fifty feet high, about 250 feet deep, traveling about 700 feet per minute, and about 30 seconds behind him and the rest of the crew. As he stopped Dodge pulled a match out of his pocket, faced the fire and lit the grass at his feet. His fire grew quickly into an expanding ring. Dodge stepped into the burned-out center and called for his crew to follow him. No one had ever seen this tactic before, no one understood, and no one joined him. While we can't be sure what the other men were thinking, or if they were thinking at all, we can imagine that at some point in the previous few minutes, some ancient brain mechanism located just above the spinal cord had settled on "run" and "ridge" as the two words to govern all their decisions. "I saw him bend over and light a fire with a match. I thought, With the fire almost on our back, what the hell is the boss doing lighting another fire in front of us? We thought he must have gone nuts." But as Sallee made it to the top of the ridge he turned back, and through the smoke saw Dodge lay face-down in the charred circle of the little fire he created. Dodge later estimated that the fire took about five minutes to pass over him, several times lifting him off the ground with its updraft. As we wrote this post we were surprised to learn that the passing of Earl Cooley was picked up by the Economist and The Telegraph, both UK publications, one ridge, one ocean and 60 years from Mann Gulch, Montana. We credit the writing of Norman Maclean who, as we have said, has the ability to make the story part of your story. But for Maclean, Mann Gulch was part of his story also. During World War I Maclean, then fifteen, worked for the Forest Service, and ran his own race with a fire up another Montana slope, winning by just enough to save his life but not his boots, which smoldered on his feet. And in August of 1949 Maclean was once again in Montana, and visited the site of the fire while it still smoked. Ultimately the thirteen who died and even the three who survived became ghosts that Maclean couldn't escape. Maclean began writing Young Men and Fire at the age of 78, hoping to give the men of Mann Gulch a completed story to sum up their lives, as he put it, to make their story "not just a catastrophe, but a tragedy". And as he came to terms with his own mortality, the book is also an attempt by Maclean to find a story that helped him understand his life. We at marketmambo feel confident that we could recommend Young Men and Fire to our readers with little concern of disappointment. 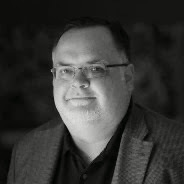 And as we've already mentioned, we were surprised to discover that the story of Wag Dodge has captured the imagination of those interested in insight and creativity. While fifteen other men ran for their lives up a ridge, driven by the instinct inherent of flesh to preserve itself, Dodge stopped and did the unexplainable. He realized that the driving muscle of their legs would not save them. This was not a reasoned decision. Dodge did not stop and consider his options. He did not conduct a meeting or an idea generation session. Furthermore, and dear reader please keep this in mind, he was never trained to start an "escape fire", and in fact, no one in the Forest Service had ever heard of such a thing. Dodge had a moment of insight while all others were driven, and perhaps blinded, by instinct. At the inquiry established to investigate the event, Dodges only explanation was "it just seemed the right thing to do". As those of you who have previously joined us at this post know, marketmambo is a place where I, Tito Mambo, work through the puzzles that rest uneasily in my mind. And here is why we have been called back to the post by the death of a firefighter, Earl Cooley, and have taken our readers inexplicably up the slope of a Montana gulch. In the most unlikely, yet the most dramatic, of situations, insight occurred, stripped of all fancy words and deep thinking, and revealed its most basic biological, primitive potential in all of us. On the marketing dance floor, it is truly creativity and insight that drive the tune. Yet we cannot summon it on demand nor avoid it once it starts. We promise insight and creativity to others, and expect payment in return, but cannot explain it any better than the Greeks who, almost 3000 years ago, believed that insight came from a god singing into their ear. We know that we rarely offer answers to the questions we raise and have made no attempt at an answer here. Perhaps this post is meant to help clarify the questions. What is insight? What is creativity? Where do they come from? And most importantly, what can we do to encourage the gods to sing in our ear. We hope to take on these questions in upcoming posts, and maybe a few more we couldn't anticipate. We have no plan, only inclination, which seems to be how we start most ventures in our life. Mann Gulch is still today remote and inaccessible, and still littered with rattle snakes and still able to rise to over 100 degrees on an August afternoon. Some are drawn to the site by the ghosts and the story, some make it. 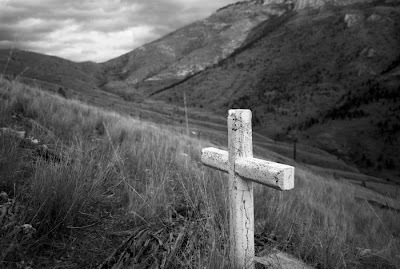 If you ever make it to the north slope of Mann Gulch you'll find thirteen concrete crosses, each marking the spot where a man fell. These crosses were made and erected by Earl Cooley, who climbed the steep grade to maintain them until a few years before his death. This is a masterpiece that ranks among the very best of the MarketMambos. "Quick-thinking spruce" indeed.